Neural is a professional Expert Advisor, which implements the strategy of trading using neural networks and genetic algorithms. Machine learning is widely used in various fields and is intended to replace the human brain for solving complex problems of classification and prediction. Training of a neural network is performed on a data sample (historical data). The neural network save the trouble of constantly changing the strategy, it is sufficient to simply retrain the system for the current market situation. This product combines two modern programming technologies, such as genetic algorithms and neural networks. It also applies a cyclic scheme for changing the robot parameters, which makes it possible to characterize the robot as capable of adaptation to changes in the price function. Information on the operation principles is described in the beginning of the discussion. It should be noted that testing is quite complex. Since it is quite time-costly, if the neural network is retrained every hour. In practice, it is only possible to test it to a certain approximation and to see the general operation principles. Therefore, the default settings in the robot are provided only for demonstration. 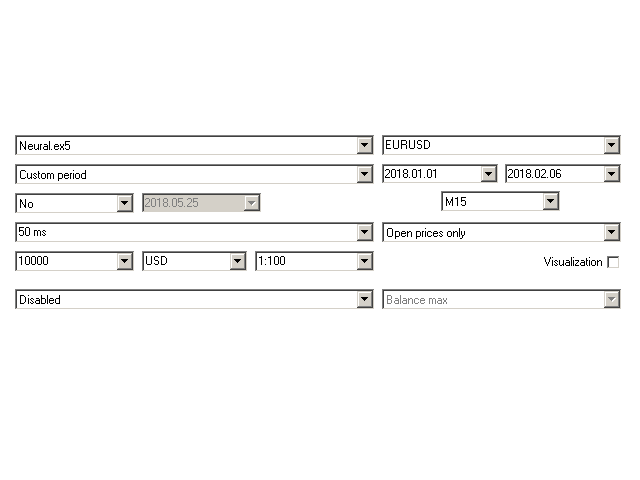 The settings recommended for live trading are also provided. The difference is that the neural network takes a large history sample for live operation and learns much more accurately (and therefore longer). This takes a lot of time, and certain limits are present when testing. For live trading, however, everything is simpler, as there is enough time for hourly optimization. With the medium (recommended) parameters of the neural network and sample length, training takes 5-15 minutes. In this case, the learning speed depends on the CPU power. 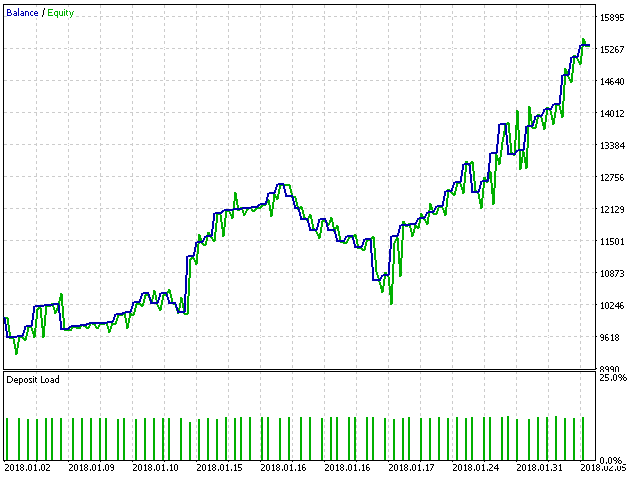 The robot can be run on any chart with the recommended parameters. Also, if the CPU is powerful enough and when working on timeframes higher than M5, the neural network complexity and the history sample can be increased. Increasing the complexity of the system only improves predictability. TypeFilling - order filling type. OnComment - enable comments on the chart. ShowLine - display the result of the genetic algorithm in the form of limes. OnBuy - enable only buy trades. OnSell - enable only sell trades. LimitSpread - spread limit (no entries above this value). Lot - lot size for market entry (overrides Risk). Risk - lot calculation depending on the deposit. LotExponent - ratio that defines the progressive lot increase. LimitGrid - limitation of the grid steps. kStepGrid - coefficient fro limiting the number of points between consecutive orders. kTP, kSL - coefficients for stop loss and take profit. DrawDown - the maximum drawdown, at which closing occurs (in % of a deposit). 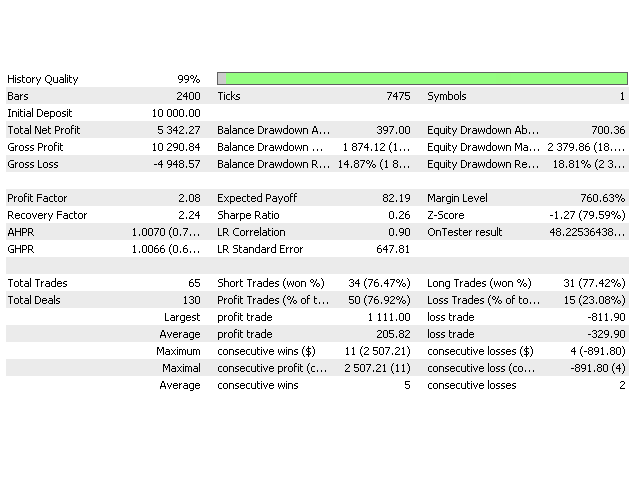 DrawUp - the maximum profit, at which closing occurs (in % of a deposit). ReOptimizationNN - period of re-optimization. InputDataRSI - data from the RSI indicator. InputDataAD - data from the AD indicator. InputDataSAR - data from the SAR indicator. HistoryNN - size of the history sample (in bars). InputNN - the number of neural network inputs. StepNN - maximum steps of the neural network. EpochNN - maximum epochs of the neural network. DeltaNN - training accuracy of the neural network. LevelSignal - threshold level of the neural network, which is perceived as a signal. kMinimumGridStepProc - filter of price noise for the genetic algorithm. ServerTimeFilter, StartHour, StartMin, FinalHour, FinalMin, FridayOn - limit the trading time by time of the day.